The Martindale-Hubbell Legal Directory lists Mr. Brown as a preeminent attorney (awarded to approximately 5% of practicing attorneys nationwide), and has awarded him its AV rating (highest possible for legal proficiency and professional ethics). 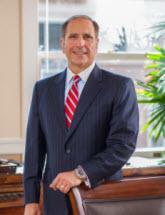 Since leaving the Department of Justice Tax Division for private practice in 1992, Mr. Brown has represented individuals and businesses, throughout the United States, in complex federal tax matters, including IRS Audits and Appeals, IRS Problem Resolution, Tax Litigation and Criminal tax matters. Mr. Brown is uniquely qualified to represent clients in complex and contentious tax controversies, disputes and litigation. A former U.S. Department of Justice Tax Division trial attorney, with years of experience in complex tax matters, Mr. Brown has an insider's understanding of IRS and Department of Justice Tax Division policies, procedures and strategies. He is a veteran trial attorney who is also highly proficient in the technical aspects of tax law. Mr. Brown has tried over 100 jury trials and over 400 bench trials to verdict, and has settled countless other matters at the IRS administrative level or otherwise without the need of trial. Since college, Mr. Brown has been a consummate student of taxation, generally, and tax law in particular. He works diligently and continuously to stay well schooled and highly proficient in Federal tax law. Prior to entering private practice, Mr. Brown served as a Trial Attorney with the U.S. Department of Justice Tax Division in Washington, D.C., where he represented the United States in numerous high-profile and sophisticated federal tax investigation and litigation matters. Prior to joining the Department of Justice, Mr. Brown served on active duty as a U.S. Navy Judge Advocate, where he prosecuted and led investigations in a number of high profile cases including courts-martial of senior officers and two national security cases. Mr. Brown achieved the rank of Lieutenant Commander, and his decorations included the Navy Commendation Medal (awarded for performance above and beyond the call of duty).